The other day, a girl from our teen center, whose family rents the apartment pictured above, came into our office telling us about how their toilet backed up and flooded their entire apartment. An awesome way to start the week if you ask me. We went over to talk to the family and see if there was anyway we could help; it was bad...really, really bad. 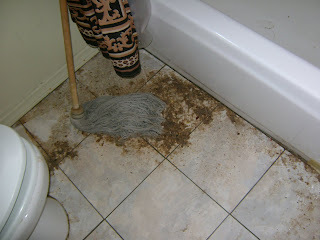 It smelled like poop and their entire bathroom (the only one in the apartment) was completely unusable. The flooding had gone through the wall and into the closet in one of the bedrooms. All of their clothes were soaked and you could not walk through the hallway without your feet getting drenched with toilet water. It was terribly disgusting. The family called the landlord numerous times with no answer. 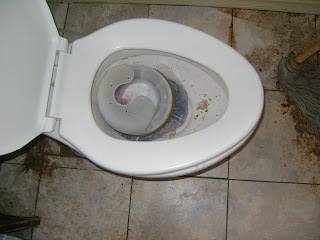 Finally, later that night, the landlord came and snaked the toilet...but he left the house completely flooded and left part of the snake in the toilet, keeping it from being usable. He said, "You guys clean it up." 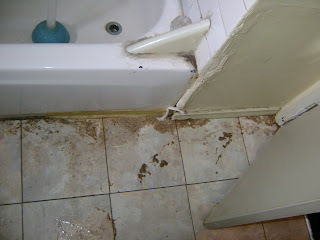 The next morning, with the apartment still flooded, the tenants were at a loss as to what to do. The single mom can not take a day off work to clean it, the kids have school, and there sure as heck isn't money to hire a cleaning company. I went over to check on them and they asked me to call the landlord to put some pressure on him. When I called, with the most polite voice I could muster up, all I got was an angry man who was clearly avoiding his responsibilities. He quickly changed his tune once we got the City involved...but seriously, what a jerk!! Slumlords. We have about 40 of them that own the run down, cockroach infested, cold water only apartments we, along with our friends and neighbors, call home. See, this is what happens when you have people who need a place to live, but don't have a social security number or the first and last month's rent. Add that to the fact that their are countless property owners who are only thinking about how to get the most money for the least amount of work, and voila, welcome to the American slums. Undocumented Immigrants are the perfect market for Slumlords in the US. After all, they have no rights or at least they don't know their rights. Even if they did, they are too afraid to speak up. Who would listen anyway? Unfortunately, this story is not an anomaly. It's funny how I asked my landlord for screens on our windows and their was a guy installing them the next day, but my neighbors (who live in the same complex) have been asking for screens for years and have yet to get them. They look at me and assume I will assert my rights, but when they look at the Mexican family, they think, "Ha, what are they going to do??" Something has to change folks, so our friend from the teen center doesn't have to go to sleep to the smell of sewage, so my neighbors can eat dinner without a hundred flies swarming their food, and so the hard working single mom can take a warm shower when she gets home from work. It just ain't right people, it just ain't right. You should call the station managers of local news outlets. Its not okay for people to get used like this. First off its bad lazy business, second its plain evil! The more I see the bigger picture the more frustrating the situation gets. There is a complete refusal to comprise on both sides of the Isle. Undocumented workers/Illegal Immigrants (both terms are offensive to someone)can't actually get help or forward movement because the Status quo is comfortable. Republicans pander with "send them all home" Democrats pander with "make them citizens"... we desperately need a middle ground that can actually move the agenda forward.